The earliest fossilized evidence of Bees dates back to 100 million years ago from northern Myanmar. Honey Bee, belonging to genus 'Apis' , have their earliest known fossilized record dating back to 35 million years ago from Europe. There are different views about the origin of Honey Bee amongst the authorities. According to one school of thought, the Honey Bee may have first appeared in Eastern Africa around 40 million years ago. As per another more popular belief, the Honey Bee is likely to have been originated in South and South-east Asia where six out of the seven currently known species of Honey Bee are to be found. The honeybee is a highly social organism with the colony consisting of a fertile Queen Bee, a few thousand fertile males known as Drones and a tens of thousands of sterile female workers. The beehive is a complex structure created by the honeybee to store eggs and honey. There are cells of wax created all over the structure of the beehive to store eggs produced by the Queen Bee. Foraging is an important activity of the worker bees who visit various flowering plant species to collect nectar. The role of honeybee in the eco-system is to help with the pollination of the plant species. 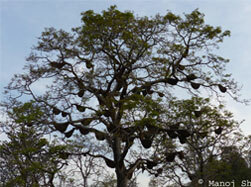 Some species are highly colonial and make their beehives in the same trees, year after year. There are more than 350 species of birds in Corbett that are insectivorous and may feed on the honeybee. Oriental Honey Buzzard, a diurnal raptor, is known to specialize on feeding on the larvae of the honeybee that it extracts from the beehives it attack. Sloth Bear is also known to attack beehives in search of the bee larvae and honey. An old 'Semul' tree on the bank of river 'Dhela' on the southern boundary of Corbett Tiger Reserve has been home to the colony of honeybees for many years.